Across the Columbia River east of Wenatchee, a complex of ridges and coulees marks the transition between two broad, nearly level plateaus: the Potholes country on the south (elevation 1,100–1,300 feet) and the much higher Waterville Plateau to the north (elevation 2,300–2,600 feet). Moses Coulee, a deep gash incised by ice-age floods, skirts the edges of the higher plateau. The southern boundary of this area is defined by Lynch Coulee and the modest Beezley Hills. Rugged Badger Mountain lies to the west. The basalt cliffs and side canyons of Moses Coulee are populated by species such as Chukar, Golden Eagle, White-throated Swift, and Rock Wren. Some of the state’s best shrub-steppe can be found on the coulee floor and in the Beezley Hills—home to Loggerhead Shrike, Mountain Bluebird, and Sagebrush Sparrow. There is dry montane forest (Badger Mountain) and fine riparian habitat for residents and migrants (especially along Douglas Creek). All of this plus a few ponds, lakes, and the deepwater Columbia River reservoir behind Rock Island Dam adds up to a series of habitats where it is easy to find 100 species of birds in a day during the breeding season. The sites have been described in such a way that you can readily link a selection of them into a loop starting from and returning to Ephrata or Wenatchee. Overall, early May offers the best birding, although March is better for waterfowl along the Columbia. The Nature Conservancy’s Beezley Hills Preserve (about 5,000 acres) shows off some of Washington’s most pristine shrub-steppe habitat. Coming from the south, the most convenient approach is by turning north from SR-28 onto Road P NW (aka Columbia Way or Monument Hill Road), 0.8 mile east of the junction with SR-281 in Quincy. The road climbs steadily to a junction (7.1 miles). Turn left (west) onto a short spur and drive 0.1 mile to communication towers atop Monument Hill at 2,882 feet elevation. There are no facilities. Be careful; the gravel road can be slick if muddy or snowy. Directly across from the spur, wildflowers and Hedgehog Cactus, can be great in May. Ice-age winds, by shifting and redepositing fine soils, played an important role in the development of the mosaic of shrub-steppe plant communities found on these slopes and ravines. The many south slopes with thin or rocky soil (lithosol) have a dazzling wildflower display in April and May. Horned Lark (common) and Mountain Bluebird are present in this habitat. Look for Loggerhead Shrike and Sagebrush Sparrow in deeper-soiled ravines below the summit where shrub cover is greater. In March and April and again from August through mid-October the top of Monument Hill makes a fine vantage to view migrating raptors. To reach nearby north-facing habitats, with different birds, return to Monument Hill Road and drive left (east) along the ridgetop to a junction (2.1 miles). Pull over to the side of lightly-traveled Monument Hill Road and walk up the road to the right a couple of hundred yards. Relatively deep soils support a healthy growth of Big and Three-tip Sagebrush interspersed with Bluebunch Wheatgrass and a host of other interesting grasses and flowering plants. Common breeding birds here include Sage Thrasher, Brewer’s Sparrow (areas of sagebrush and grasslands), and Vesper Sparrow (tracts of denser grasslands). Grasshopper Sparrow is uncommon and Western Meadowlark ubiquitous. From late March through April, keep a watch on the sky for migrating Sandhill Cranes—hundreds, even thousands exploit the thermals on these hills. Back at Monument Hill Road, turn right and continue east a short distance; the road curves north and is now called Road L NW. At the first intersection with a stop sign, you have reached Baird Springs Road, though there is no road sign (1.1 miles). Ephrata (SR-28) is 9.7 miles east from this junction. There is some excellent sagebrush birding as you continue down this road to Ephrata. Westbound, Baird Springs Road descends Lynch Coulee beside an intermittent stream to join SR-28 seven miles west of Quincy. Birding can be rewarding along this route in shrub-steppe habitats and in riparian growth at springs and other wet spots at the edges of the deeply eroded streambed—especially in migration. Moses Coulee—a giant, basalt-lined, ice-age flood channel—slices southwestward some 40 miles from the high plateau near Mansfield down to the Columbia River. Cliffs provide excellent habitat for Chukar, Golden Eagle, Canyon Wren, and other rock-loving species. The broad coulee bottom— now mostly converted to hay farming—hosts many raptors, including the breeding species plus Rough-legged Hawk and Gyrfalcon (rare) in winter. Characteristic shrub-steppe birds can still be found in remnant parcels of habitat ranging in size from small pockets to large expanses. Not far from the mouth of Moses Coulee, several waterbird sites in and near the small community of Rock Island are worth a visit. Rock Island Drive turns north from SR-28 about 12 miles east of the junction with US-2/US-97 in East Wenatchee (see inset map). A large truck stop is on the left just after the turn. Follow the main road into downtown Rock Island, staying with it as it turns left; in three or four blocks, turn right onto N Garden Avenue, across from the grocery store (0.3 mile). Drive to the end of this road (0.4 mile) and park at Hideaway Lake, an excellent waterfowl spot from November to April, when up to 20 species can been seen at one time (including Eurasian Wigeon most winters). A good location for setting up a scope is a few feet to the right along the trail that goes around the lake. Check trees near the water’s edge for roosting Northern Saw-whet Owls in winter. Return to SR-28 and turn left. Several more ponds beside the highway over the next mile are good for swans (early spring), other waterfowl, and gulls. Pull off to the right at the mouth of Rock Island Creek (2.1 miles from Rock Island Drive). Just across the railroad tracks are wetlands that once attracted a Snowy Egret. Rock Island Reservoir, visible from here, has many waterfowl in winter, including Greater Scaup. Deeper waters of the reservoir can be seen from the road to the dam, Rock Island Dam Road (0.3 mile farther along SR-28). Continuing another 3.9 miles south along SR-28, Palisades Road turns off left and enters the lower end of Moses Coulee. Cliffs over the next several miles are especially attractive to Golden Eagle and Prairie Falcon—there is a safe pullout for scanning on the left in 1.5 miles. Other birds common along the coulee are Chukar and Lark Sparrow. An obscure gravel lane on the right (about nine miles from SR-28) leads to a trailhead parking lot for Hungate Canyon (BLM). A rough hike across sagebrush into a narrow side canyon with a tiny stream flanked by clumps of Water Birch and willow may reward you with Rock and Canyon Wrens and Lazuli Bunting. Farther along Palisades Road, in 5.3 miles you come to the south access for Douglas Creek (turn left), especially known for its spring wildflowers but also for birds of the riparian zone and cliffs. The road is blocked by a cave-in in the lower part of the canyon, but you can walk the rest of the way in or drive around to the north access (next page); the approach from the north is the best way to explore Douglas Creek at this time. Birding possibilities are similar in both parts. Back on Palisades Road, another parking area and trail through shrub-steppe and along the base of cliffs is found on the right in 4.5 miles. Palisades changes names and continues to an intersection in 5.0 miles. The intersecting road, which goes north to join US-2 in about 11 miles (or south and east to Ephrata in about 12 miles), is variously called Sagebrush Flat(s) Road, Road J NW, B-SE Road, Rim Rock Road, Moses Coulee Road SE, and Coulee Meadows Road—depending on which signs or maps you happen to be consulting. Turn left (north). Off to your right is Sagebrush Flat, managed by WDFW primarily for endangered Pygmy Rabbits. The disjunct Washington population of this Great Basin species was virtually extirpated due to widespread conversion to agriculture of the deep, loose soils it requires for burrows, and the concomitant removal of sagebrush (the main component of its diet). But a reintroduction effort at Sagebrush Flat has shown some success. Proceed north 1.8 miles to a dirt track going off to the right in Rimrock Estates. Walk this area of Big Sagebrush to find Sage Thrasher and Brewer’s and Sagebrush Sparrow. Mountain Bluebirds are also common here, thanks to numerous nest boxes. Continue north on the main road and descend into Moses Coulee. Cliffs in 6.1 miles are good for White-throated Swift and Canyon Wren. Reach US-2 in 3.2 miles. Go right (east) 1.1 miles on US-2 to Jameson Lake Road and turn left. The road goes north on the floor of Moses Coulee, dead-ending in about seven miles at the south end of Jameson Lake. Significant (22,400 acres) parcels of the shrub-steppe ecosystem here and at nearby McCartney Creek are protected by The Nature Conservancy. Cliffs and talus line the route, home to Chukar, Red-tailed Hawk, Golden Eagle, White-throated Swift, American Kestrel, Prairie Falcon, and Rock and Canyon Wrens. Look for Mountain Bluebird (in boxes) and Sagebrush Sparrow, particularly in the first two miles. At 3.9 miles from US-2, park at a trailhead on the left for Dutch Henry Draw. This interesting 15-minute walk brings you to the base of the cliffs and a dry waterfall, passing through brushy terrain that is good for Common Poorwill and Lazuli Bunting. As one continues toward Jameson Lake, the embankments by the road are actually giant ripple marks laid down by ice-age floods. Shrub-steppe habitat here has more native bunchgrasses than along the first part of the road, and hosts Sage Thrasher and Brewer’s and Vesper Sparrows. The lake has been growing for the last few decades, making for some productive wetlands. Numerous waterfowl breed here, including all three teal species, Barrow’s Goldeneye, and Ruddy Duck. Look also for Pied-billed and Eared Grebes and a colony of California Gulls. A small group of Franklin’s Gulls has been seen here. For the north approach to Douglas Creek, turn south from US-2 onto Road H SW (Stotts Road). The intersection is about 13 miles west of Jameson Lake Road and eight miles east of Waterville. Proceed south, watching for Short-eared Owl and Loggerhead Shrike along the way. This county road eventually descends Slack Canyon, reaching Douglas Creek in about eight miles. Turn right here, drive a short distance, and park by the binocular sign at a locked gate. You may walk up this unroaded part of the canyon for about eight miles for a true wilderness experience. More of Douglas Creek can be explored by returning to the main gravel road and going downstream for about a mile. Several primitive campsites are off to the side of the road. Park at the third campsite—the center of the Douglas Creek bird-banding station. Over 100 species of birds have been seen in this section of the canyon. Common breeding species include Chukar, Red-tailed Hawk, Common Poorwill, American Kestrel, Western Wood-Pewee, Eastern Kingbird, Cliff Swallow, Rock and Canyon Wrens, Cedar Waxwing, Yellow-breasted Chat, Lark Sparrow, Black-headed Grosbeak, and Lazuli Bunting. During migration the canyon is jumping with most of the common transient flycatchers, vireos, warblers, and sparrows. Interesting passage species, among them a few rarities, are Least and Gray Flycatchers, Cassin’s Vireo, Veery, Hermit Thrush, Black-and-white, Nashville, and Townsend’s Warblers, Northern Waterthrush, American Redstart, Wilson’s Warbler, and Lincoln’s and Golden-crowned Sparrows. 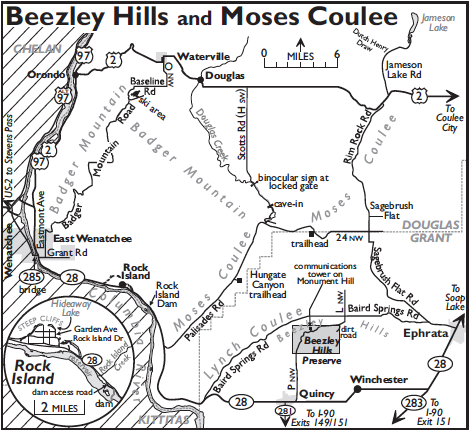 The county road is closed south of here due to a cave-in; if and when it reopens, you will again be able to drive down the rest of the canyon to join Palisades Road in Moses Coulee. In the meantime, you can walk. Badger Mountain lies between the Columbia River and Moses Coulee, northeast of Wenatchee. Its upper elevations support the most extensive conifer forest in the western Columbia Basin. Badger Mountain Road goes up and over this large ridge system to Waterville in about 25 miles. In East Wenatchee, turn east from SR-28 onto Grant Road (first intersection south of the SR-285 bridge), then left (north) in one long block onto Eastmont Avenue, which becomes Badger Mountain Road as it leaves town and begins climbing. Look for bluebirds at lower elevations and for Spotted Towhee, Chipping Sparrow, and Cassin’s Finch higher up, in brushy terrain on south-facing slopes. The road crosses the crest in about six miles, then remains at an elevation of 3,000–3,500 feet as it contours along the southeast face of Badger Mountain until reaching a ski area about 20 miles from East Wenatchee. Along the way, stop in several places in the Ponderosa Pine and Douglas-fir forest to look and listen for Hairy Woodpecker, Dusky Flycatcher, Cassin’s Vireo, White-breasted Nuthatch, Swainson’s Thrush, and Western Tanager. Northern Goshawk has been seen here in May. Take the main road (now called Baseline Road) east from the ski area for two-plus miles, then turn north on Road O NW (also called Waterville Road) and drive another 2.5 miles to US-2 in Waterville. If you are driving this route in reverse from Waterville, go south from US-2 a block south of the Catholic church onto S Chelan Avenue, which becomes Road O NW/Waterville Road upon leaving town.